Numark, the world’s leading innovator of DJ solutions, is set to debut their N-Wave 360 desktop DJ monitoring system at the upcoming BPM 2014 show to be held in Birmingham, England. 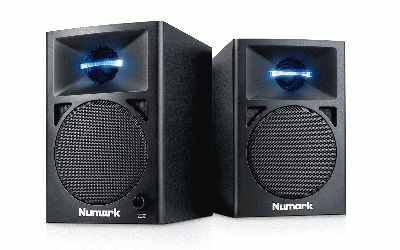 Designed to offer the DJs impressive desktop sound in a compact format, the self-powered N-Wave 360 includes two matched speaker cabinets. Each cabinet contains a 1" silk dome tweeter—with blue LED illumination—matched with a 3" woofer via a precision crossover circuit. The onboard amplification system can deliver up to 60 Watts of peak power. These magnetically shielded powered monitors are ideal for a compact studio setup; they won’t interfere with other electronics and offer extra protection when used near a video monitor. The amplification system for both speakers is cleverly mounted in one unit, requiring just one power outlet to drive two speakers. Unlike many studio monitors, the volume knob is conveniently located on the front panel for easy access. High-density materials are used to increase acoustic efficiency, and bass porting improves the low-end response. Concave oval waveguides provide a wide listening area “sweet-spot” for accurate imaging and fatigue-free listening. Radial-edge speaker baffles minimize audio distortion.